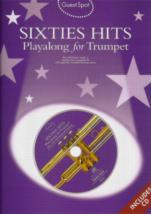 Guest Spot 60s Hits - Trumpet Book & CD. Step into the spotlight and play along with the superb backing tracks on the specially recorded CD. Contains ten of the best hits from the sixties. Tunes featured are: All My Loving, Brown Eyed Girl, Cant Take My Eyes Off You, Daydream, Good Vibrations, Its Now Or Never, Mrs Robinson, Sweets For My Sweet, Under The Boardwalk & What A Wonderful World.